The game of Craps is the most popular and crowded at the casinos. It is full of people screaming and shouting, with ebullient alcoholics, and yanks, asians and european gamblers betting on dice rolls. Compared to slots machines, Craps the far more exciting option and requires only a little understanding to get started. 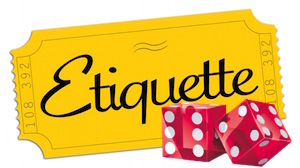 To help you fit in at the Craps tables, you should take the time to read some important Craps etiquette tips below. They’ll not only help you get started but also prevent you being chucked out or accidentally ruining the game for others. When you’re ready to place bet you should hand your money to one of the base dealers. These are the guys that stand either side of the boxman to collect and place bets (in quiet games there might only be one base dealer). The dealer will then give the boxman your money or exchange chips for you. It’s important to remember that the dealer is not supposed to touch the customers. You should place your money on the table and ask for change or chips. When betting you need to understand the rules of the game. Craps can be a bit wielding to the first time player so you can’t expect to be able to understand the game within the first minutes. When you feel ready to place a bet, place your chips on the table and tell the base dealer what you want e.g. proposition bets or “Hard 8”. It is considered rude to “late bet”, i.e. make wagers after the dice have left the middle of the table. It slows play down and the stickman or pitboss can disallow such a bet at his discretion. When making Field Bets or Big 6 or Big 8 you should place your chips on the table yourself (the bets are located in the corner behind the Pass Line). Place Bets and Come Line bet will be tracked by the dealer who pays the players directly. For Hardway bets and other proposition bets, players should throw their chips onto the relevant part of the table and shout to the stickman what they want. It is the stickman’s job to tack these bets and to tell the dealer when a player has won. The Free Odds bets are not displayed on the table, to place an Odds bet you should say to the dealer “Odds on my six, please”. Finally, when the dealer calls out “The dice are out!” or “Hands High!”, you must stop placing bets and make room for the shooter to role. Hands High means you must take your hands off the table to give the pitboss an easier time. It is perfectly permissible for you to skip the turn of the Shooter in order to give someone else a throw. Just pass the dice to the person on your right in clockwise manner. Remember that whoever is the shooter needs to place the minimum bet on the Pass/Don’t Pass Line. When it is your turn to roll, try not to take too long and make wait for the signal of the dealer. Some drunk players spend too much time “wishing”, shaking or blowing on their dice. This slows the game down and creates unnecessary suspense and drama. Just take a few shakes and roll the dice. When you roll the dice you must make sure they reach the end of the table and bounce of the triangular/felt. This ensures randomness and prevents cheating. It is considered taboo, though not illegal, for a shooter to leave after a successful Come Out roll. The shooter retains the right to keep rolling until he or she sevens out (loses the point). However, if the shooter leaves before the Come out roll than the next player should roll with permission from the Pit Poss. In most casinos it is forbidden for you to place food or drinks on the table. If spilt, it can soak the cloth and cause expensive damage. Most casinos have added cup holders under to rails of Craps tables which is where you should place your drink. You should also avoid smoking over the Craps table as dealer do not appreciate the ash spilling onto it. It is good etiquette to tip dealers when you leave on a win. Most dealers receive minimum wage and receive a high percentage of their salary this way. In Craps the correct thing to do is drop some chip on the table and announce “For the House”. You should always avoid getting overtly drunk in casinos. Not only can this damage your bankroll but it can also lead to fights, confusion over chips and eventually getting kicked out. Casinos often entice their customers to drink because it makes them depart with more money. However, there is a limit to what they will acccept and most casinos will happily chuck you out once you’ve lost enough money.